Submissions: General articles should be sent to editor Brian Pankuch at the above address. We would appreciate both 1) printed copy (hardcopy) and 2) a readable file on a Macintosh or ffiM compatible 3 1/2" diskette. Submission deadlines: Fall issue - Sept. 25; Spring issue - March 15. ALL NEW AND RENEWAL SUBSCRIPTIONS : PLEASE SEND REMITTANCE TO M. Lynn James. Dept. of Chemistry. University of Northern Colorado. Greely. CO 80639. RATES: USA 1 year $2.50, two years $4.50: Other countries 1 yr $5, two yr $9. Please make a check or money order payable in US funds to Computers in Chemical Education Newsletter. One to three issues are published per year. Managing Editor Henry R. Derr, Laramie County Community College, Cheyenne, WY 82007 HDERR@eagles.lcc. whecn..EDU. Jim Beatty, Chemistry Dept., Riporr_Col_lege, Ripon,_Wt_?4971, BEAITYJ@ACAD.RIPON.EDU. 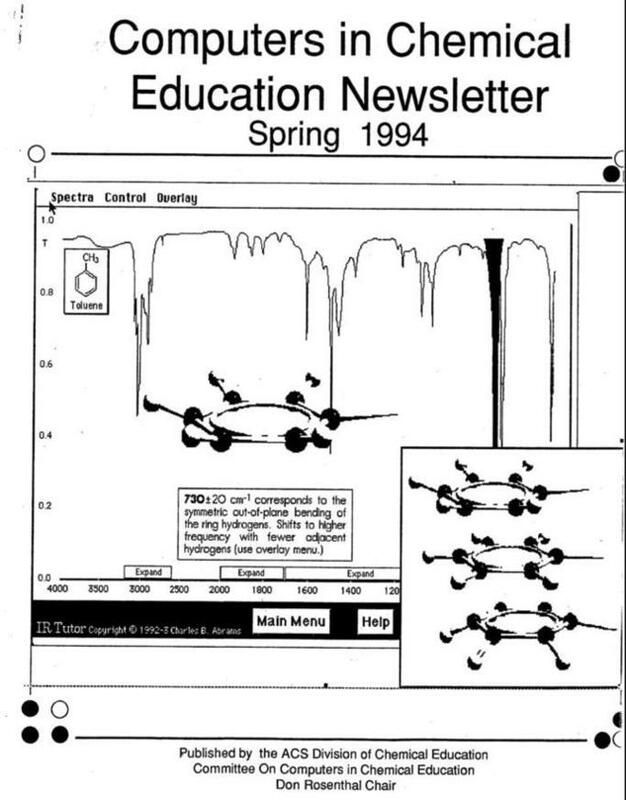 Cover: Visualizing Infrared Spectroscopy with IR Tutor--see review by Bill Chipman in Fall 1993 edition The newsletter is done using Aldus PageMaker.